Sometimes I have cravings and I don't know why or where they come from. For example, the other day I really wanted gummy bears. I don't even really like gummy bears. 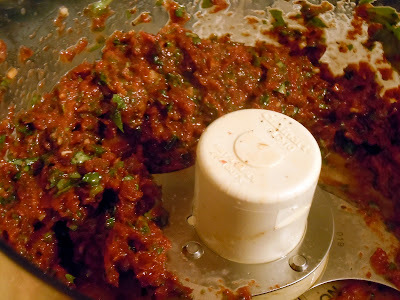 Another example is sun-dried tomatoes. I think I've maybe had sun-dried tomatoes once in my life. If that. I don't know what's so special about them or why I've been craving them, but lately whenever I go to the store I always seem to find the little jar of sun-dried tomatoes packed in olive oil just staring at me. Begging me to buy it. I couldn't take the peer pressure, so I gave in and bought it. Then I had a jar of sun-dried tomatoes and no idea of what to do with it. 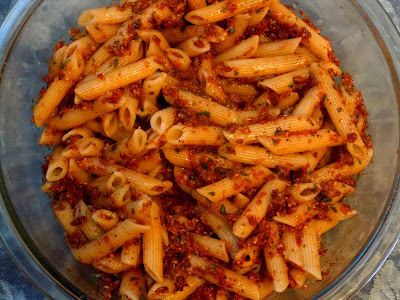 This recipe was super quick and easy, and it really showcased the flavor of the sun-dried tomatoes, which is exactly what I wanted. 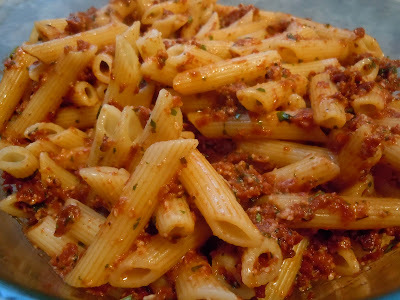 You can never go wrong with pasta, so this dish was perfect. You could also take the pesto and spread it on crackers as an appetizer or on a sandwich as a spread. I really enjoyed it cold the next day, too. Enjoy! This is how it looks after a few pulses in the food processor. Add a little pasta water to thin it out and make a sauce. Delish! Cook the pasta in a large pot of boiling salted water until tender but still firm to the bite, stirring occasionally, about 8 minutes. Drain, reserving 1/2 cup of the cooking liquid. Add the pasta to the pesto and toss to coat, adding enough reserved cooking liquid to moisten. Season the pasta, to taste, with salt and pepper and serve.